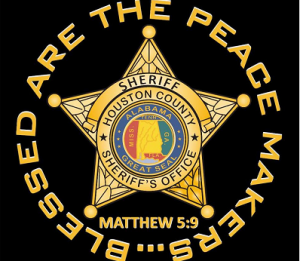 HOUSTON COUNTY, Ala. — A sheriff in Alabama has removed a Scripture decal from all of his patrol vehicles upon recommendation following the threat of a lawsuit from a prominent church-state separation group. “Thank you for having the courage to display the decal! Maybe others will follow,” remarked on commenter named Mike. But according to reports, the group Americans United for Separation of Church and State sent two letters to the sheriff’s department, demanding that the decals be removed under threat of a lawsuit. Houston County Administrator Bill Dempsey told the Dothan Eagle this week that county officials spoke to local attorneys, as well as their insurance carrier, and weren’t desirous of entering a costly legal battle. But several commissioners in the county state that they believe the decals should have remained despite the threat. He said that he has been receiving numerous phone calls about the decals after it was learned that the sheriff removed them. “If the citizens of the county would find out where to get those decals and how to get them and put those decals on their cars like [Valenza] did, that would show the people are standing up for what they believe in,” added Commissioner Doug Sinquefield. The Wisconsin-based Freedom from Religion Foundation (FFRF) has also sent Valenza a letter, demanding that the decals be removed because they promote Christianity with taxpayer dollars.